In a world of big, empty video game cases devoid of instructions or interesting art, one game is fighting back in a small but beautiful way. The Binding of Isaac first came out back in September of 2011. Since that time, however, Edmund McMillen and his development team have been releasing expansions and add-ons for the roguelike that keep breathing new life into the game. 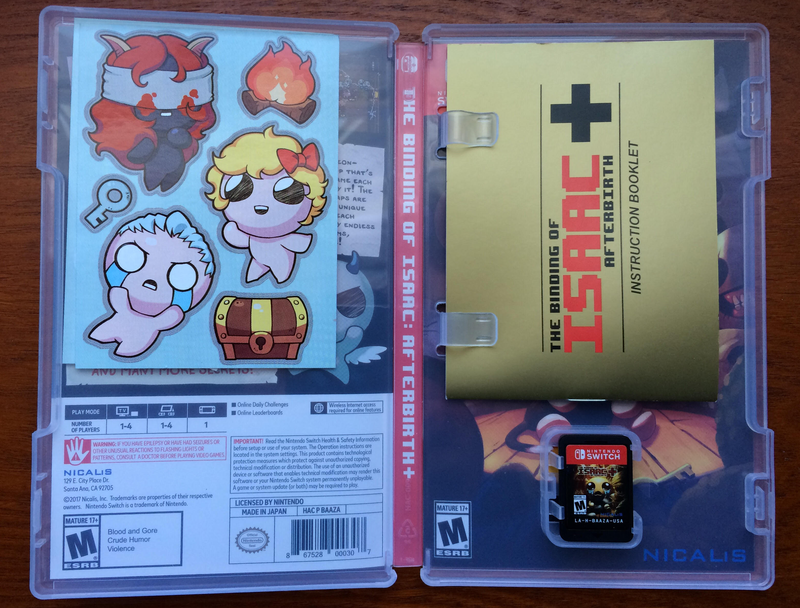 Afterbirth+ is the latest version, and for its Switch debut the game comes with an instruction booklet and stickers that mirror what the original The Legend of Zelda came with when it released on the NES. At only eighteen pages total, the tiny leaflet lays out all of the game’s key mechanics and story ideas with charming concision. Like any great instruction manual, it helps explains the basics of how the game works and what to expect without ruining any of the hidden secrets or deeper mysteries at play. It’s also made of quality card stock with a gold cover that mimics its spiritual predecessor. (I should note that the booklet and stickers are part of the special “pre-order” version of the game, and to my knowledge won’t be included in later shipments). “If you save the Strength card until you get to a devil room, you can use the card to get an extra devil deal,” it says on the bottom of pages 15 and 16. On page 8 it explains that new characters are unlocked after completing specific tasks while page 12 reveals that Isaac can use bombs to blast open different walls and reveal hidden doorways to other rooms. It’s the kind of stuff anyone who’s played The Binding of Isaac or Zelda before already probably knows, but articulating it in print form somehow crystallizes the information’s practical effect. The Legend of Zelda: Breath of the Wild was the first game in the series to arrive with no secondary materials. Nintendo still hasn’t confirmed if it’s decided to do away with manuals entirely, including the digital versions it transitioned to for the Wii U, but it’s safe to assume in most cases games on the Switch will arrive in boxes full of nothing but the little pieces of plastic on which they’re stored. I still have the booklet for Ocarina of Time sitting on a shelf in my apartment, now wrinkled and worn after years of use like the ancient artifact it was always intended to simulate. The very fact that games can be turned on and off gives them an inherent ephemeral, especially as the technology housing them shrinks into oblivion. The same way an album insert with lyrics or the over-sized art on a twelve inch vinyl case help give the music within an added dimension, booklets for games aren’t just information dumps: they’re road maps helping to bring the game’s world into this one. Particularly for games like The Binding of Isaac and those from the series that inspired it. Booklets have mostly been replaced by often inane tutorial sequences, but games that already try to give away as little as possible, and prefer to lead by suggestion rather than direct hand-holding, are proof the little paper trinkets have other uses. When I’m not playing Afterbirth+ I can still thumb through the small, weighted pages of its manual and retrace my steps and anchor them to something that will still be there even when I turn the power on my Switch off.